Cultural heritage has become a crucial target in conflicts. In this paper, I will discuss controversies and challenges when symbolic buildings of high value as cultural heritage are harmed due to terrorism, but also by ignorance of their architectural value. The value may be as economical or material resource, historical significance or architectural quality. At the same time, contemporary needs ask for buildings adapted to changing needs. My point of departure will be the bomb attack on the Norwegian government quarter on July 22nd, 2011. In the middle of Norwegian holiday time, when a large part of the population was enjoying their free time and long, bright summer nights, the shocking news of a bomb attack to the Government Quarter in the centre of Oslo reached listeners all over the world. 8 people were killed, 10 severely injured and 30 treated for their injuries. Interrogations showed that the terrorist blow was meant to harm the social democratic system and its values, and what the attacker Anders Behring Breivik found to be islamist friendly politics of the Labour Party government. 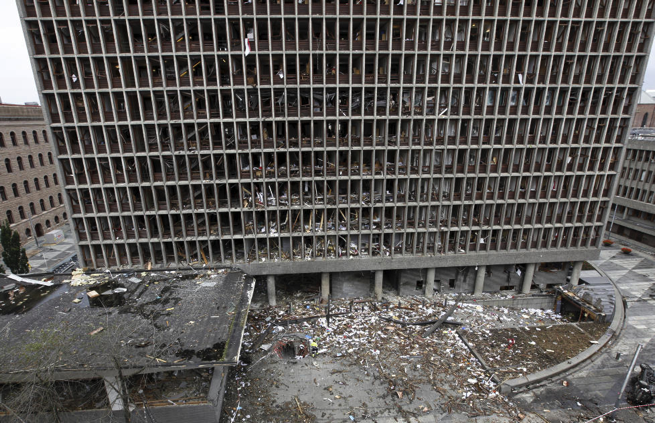 The H block of the Government Quarter after the bomb attack on July 22, 2011. Photo: KRIPOS/Scanpix. further, Breivik executed a massacre of future politicians of the Labour party, participants at a labour party youth camp at Utøya near Oslo (77 young people were killed and 150 were hospitalized due to their injuries). The main government building, the H block that was damaged in the attack, was designed in the 1950s by Gunnar Viksjø (1910-1971), one of the nation’s most prominent architects at the time, to house offices of the state administration. The bomb destroyed the interior of the lowest floors and environments of the H block, but left other buildings nearby less harmed. We will have a look into the architectural qualities of the building and its nearby sibling the Y block, and the debate concerning the future fate of this very central city area in Oslo. Questions related to finances, functionality, security, architectural quality, cultural heritage and memorial significance both of the damaged H block, and the ajacent Y block that was not harmed in the attack, were elements of these discussions. My lecture will discuss the following questions attached to these buildings of high architectural value and significance as cultural heritage. It is decided that the H block will be preserved, but maybe built higher, and surrounded by new buildings. What kind of memory will it convey? How about its kin, the Y block? Should it be demolished, including its integrated art works of very high value, to give way for new plans of the area? How about the openness created by the architect to give people of the social democratic welfare state direct access to the country’s highest representatives, in a time where terrorist attacks have to be considered? Should the area of historical significance be closed off to Oslo’s citizens for security reasons? During political conflicts and war, we are used to the alarming news that buildings and other cultural works are destroyed on purpose. We have witnessed Turkey’s systematic erasure of Greek heritage in the occupied territories of Cyprus from the mid-70s and onwards, Serb artillery burning the National and University Library of Bosnia and Herzegovina in 1992, Taliban’s destruction of the buddhas of Bamiyan in Afganistan in 2001, and DAESH’s recent demolition of heritage in Palmyra or any shrine or monument not being in accordance with their conception of religious practice. It is often the symbolic significance of the buildings that causes such political motivated attacks. Even of less impact than other international examples, the symbolic value of the Government Quarter in Oslo is very strong for Norwegians, which I will return to later. Should the state itself, in a period of peace, destroy its own heritage? The highrise H block of originally 15 stories where the prime minister’s offices were located, is contrasted by the lower, curved Y block of three stories where the Ministry of Knowledge was located in recent years. The H block was inaugurated in 1958 and the Y block in the same architectural style, by the same architect Erling Viksjø, was completed in 1969. Both buildings are adorned with an innovative concrete/stone surface called “natural concrete”, a method invented and patented by the architect. Before the cement of the façades was cured, the formwork was removed and the surface sandblown to create a durable and beautiful surface where the natural stone appeared as decorative elements in the facade. In this way, Viksjø’s buildings constructed by concrete sceletons got facades of natural stone. By using different colours and size of the pebbles, varying patterns and roughness give the surfaces diverse qualities. The sandblowing technique also made it possible to integrate works of art directly into the concrete walls of the façades and on interior walls. By letting artists use sandblowing as a way of artistic expression, Viksjø wished to integrate art in his architecture. Among profiled contemporary artists, Carl Nesjar (1920-2015) is the one best known for using such methods, and he had through 17 years a close cooperation with Pablo Picasso (1881-1973). The buildings also have integrated works by Tore Haaland (1918-2006), Odd Tandberg (1924-), Inger Sitter (1929-2015) and Kai Fjell (1907-1989). The area binding the H block, the Y block and other buildings together, is partly designed to continue the qualities of the natural concrete facades. Geometrical patterns give vitality to the pedestrian areas, which connected the buildnings, parking lots and garages. The H block was designed through different stages during the period 1940 to 1958. Statens bygge- og eiendomsdirektorat (The Directorate for Building and Properties in Norway) announced an open competition for the H block Government Building project in 1939, and 49 entries were submitted. Preconditions were to provide an economic and effective system of ground plans combined with a representative design. In March 1940, the entries Rytme designed by Ove Bang and Øivin Holst Grimsgaard, Vestibyle by Erling Viksjø, U by Nils Holter and Fri by Dagfinn Morseth and Mads Wiel Gedde were awarded as four equal winners (Tostrup: 92, 95-96). Viksjø’s entry shows a rather strict raster system, with window frames withdrawn from the outer facade grid. In many ways, this makes his proposal stronger, but also heavier than other entries, as Bang’s more transparent glass body. 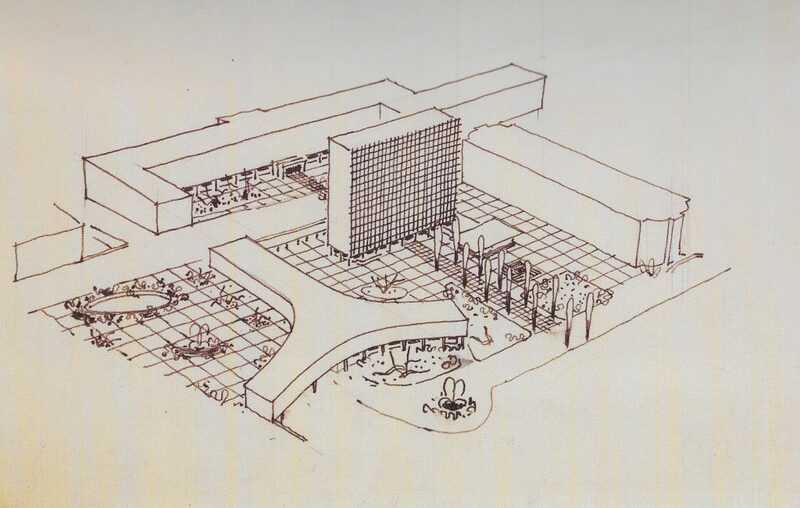 Development of the Government Quarter, sketch by Erling Viksjø, probably 1958. Photo: Andreas Harvik/Nasjonalmuseet. Two further steps in the development of the area were anticipated, but only one was completed. In 1958, Viksjø continued to work on a possible extension of the Government Quarter, and a drawing probably executed in 1958 shows a second, Y-shaped building complementing the highrise. Now, we will have a closer look at how we plan to deal with these buildings today. The first question raised after the bomb attack in 2011 was whether the H block should be saved or demolished. Rigmor Aasrud, Minister of Local Government and Regional Development stated already the day after the bomb attack that it probably would be far too expensive to reconstruct the building, it was probably too damaged, and further it did not have any architectural value. Then followed a long process of investigations: Was it structural possible to use the H block in the future or was the structure too damaged? How about the human factor? Should traumatized employees who had lost their colleges or miraculously avoided a fatal situation in the bomb attack be forced to go back to work in the same building? Later investigations showed that the structure of the building was not severely damaged, and that it could easily be rebuilt as a functional office building with its remaining qualities intact. Experts on architectural history also pointed to the architectural value of the building, and the fact that it was a core example of the Norwegian welfare state’s open form architecture of the postwar period. On the other hand, the human factor was a challenge. But the buildings have values of their own right. When the bomb attack hit the H block, the Directorate for Cultural Heritage in Norway was already preparing a listing of both the H block and the Y block as part of the National Protection Plan of Buildings owned by the State (Landsverneplan for bygninger i statens eie). All the same, the bomb attack triggered revised debates on the future development of the Government Quarter. Questions were raised related to architectural quality, administrative functionality, material resource value, security challenges and work quality for traumatized employees. In June 2013, the result of the first concept investigation by architects Metier, LPO og OPAK for a possible future use of the buildings in the Government Quarter was published. The commission was to find a long-time solution meeting the necessary demands of security and functionality, and the investigation conluded that it would be rational to demolish and reconstruct the buildings. In Oktober 2013, an additional concept analysis was delivered by the Directorate for Cultural Heritage in Norway. This investigation concluded that both the H block and the Y block have national value and should be preserved. Probably it would also be resource effective to preserve them vs demolishment and reconstruction. In May 2014, Prime Minister Erna Solberg and the Minister of Municipal Affairs and Modernization, Jan Tore Sanner (none of them belonging to the Labour Party) presented the plan for a New Government Quarter where the H block would be preserved, stating: “The H block is the most significant symbol building of the modern Norwegian Welfare State after WW2. The H block is among the best examples of monumental modernism, and the art works stand in a special position among recent Norwegian history of art and architecture” (Statsministerens kontor). So, finally, the H block was saved. The Y block should, however, be demolished to give space for new buildings, while two of its integrated art works should be preserved and moved. Only in the very last years, huge concrete buildings designed and constructed in the first decades after WW2 have been evaluated for possible protection. In many ways, they are too recent to be regarded as cultural heritage in the public and professional opinion. They are experiencing their mid-life crisis, as Siri Hoem puts it in a chronicle (Aftenposten 04.08.2015). If we had the patience to wait another 10-20 years before judging their future, maybe we would appreciate them otherwise. Quite recently, a profiled Norwegian lawyer and former head of the Norwegian Police Security Service, Ellen Holager Andenæs, in the popular Friday evening programme Nytt på Nytt October 9th 2015, several times claimed that the H block had no value for people, that it was just ugly. “It’s UGLY. Case closed”. This was in a discussion with Jørn Holmene, head of the Directorate for Cultural Heritage in Norway. I suppose that her view represent a substantial part of the Norwegian population’s view of postwar architecture, including bureaucrats who have been or will be working in the building in the future. The buildings of the Government Quarter were initially seen as quite controversial because they repressed a beautiful city area in the 1950s, further because they by many were regarded as “ugly”, ultimately destroyed by an ultra-conservative activist who wished to harm the symbols of the political social democracy and the welfare state. On the other hand, the discussions on the significance of the buildings, both as architectural heritage and as an important memory of the nation’s recent political history have had its effect. The decision to preserve the H block as part of a future city renewal of the area has been accepted without much resistance. The problem is that the Y block has to go, according to this plan. This will be a huge loss, seen from an architectural historian’s point of view, as such a composition of building bodies is to be found very few places in the world. A superior example is the UN Headquarters in New York, consisting of the office tower for the Secretariat designed by Le Corbusier, and the Assembly Hall in a separate building designed by Oscar Niemeyer. The assemblage was erected in 1947-49. In Oslo, the rectangular highrise block is contrasted to the curving façade of the lower Y block in a very similar way to the UN buildings. Another point is that buildings with curving facades over a ground plan of Xs and Ys were used several times for buildings associated with the postwar international cooperation work among democratic states. 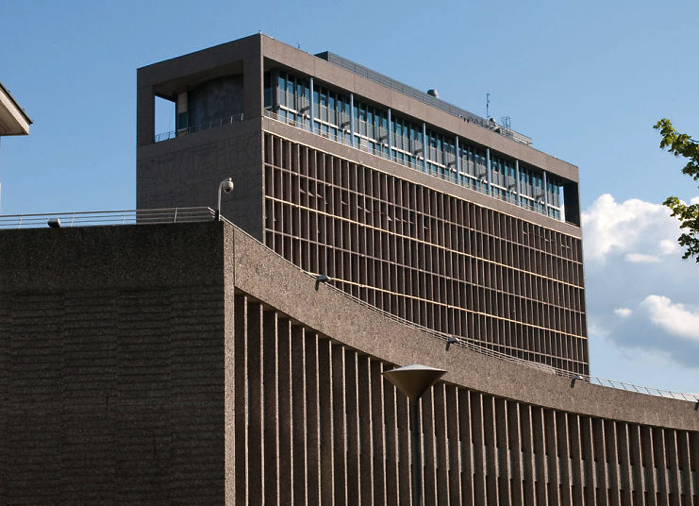 Further examples are the Unesco Building in Paris, designed by Marcel Breuer, Pier Luigi Nervi and Bernard Zehrfus and built in 1952-58. Marcel Breuer used this shape for several buildings. Another international example is the Berleymont Building in Brussels, directly inspired by the UN Headquarters, and designed by Lucien de Vestel and Jean Gilson, built 1963-69. The UN buildings were erected at the same time as Viksjø submitted a revised version av his H block design. In 1958, he proposed the Y block as a strongly contrasted building volume, and there is reason to believe that he knew the design of the UN Headquarters, designed by two of the most internationally renowned architects of the time. This assemblage of buildings were erected in Oslo, Norway, but Norwegians wish to remove half of the composition, maybe the most important part, due to what I will call pure historic ignorance. The area around the H block and the Y block was an open, public accessable area where everybody could walk literally through the lavish buildings of the state administration. This was exactly in accordance with Sigfried Giedion, Josep Lluis Sert and Fernand Léger’s thesises of ”Nine Points on Monumentality” in their paper published in 1943, and in Giedion’s article ”The Need for a New Monumentality” from 1944. Public resources should be used for the obligations of the welfare state to the contemporary society’s living population and their everyday needs, not to costly monuments of the dead. In Norway as anywhere else, concrete, often with a very rough and untreated surface, was a preferred material to obtain this new kind of monumentality for public buildings. Schools, hospitals, town halls, sport halls and bank buildings were erected in raw concrete with few decorative details except the aestetic qualities of the concrete itself. Viksjø had such principles more or less in front of him when he designed the Government Quarter, but he enriched them with his innovative use of concrete. Anyway, his planning was in accordance with international, contemporary, politically conscious architectural theory. The new, 2015 plans for the Government Quarter states that the H block will still be the highest building of the area, but this will be obtained by building it even higher than its extension of 1990 by Per Viksjø. Surrounding buildings will also be quite high. So – what kind of public area will this be in the future? Which memories will it convey? That a bomb explosion led to a thorough transformation of the area? Probably the area will not be very attractive for pedestrians, if they should be allowed to enter. We will loose the openness originally so characteristic of the Norwegian Government Quarter, due to security reasons. We could have chosen to preserve the main buildings, the H and Y block, as functional office buildings. We might even recognize their value as material resources not to be thrown away at extra costs, in addition to keep them as monuments of important political ideals for the benefit of society that a terrorist did not manage to destroy. We might even be proud of them. And it is not necessarily a good idea to compress the whole state administration in one place – concerning security. Current plans for the area will destroy the unique composition of two contrasting, but related buildings of very high architectural quality. It will transform the Government Quarter into a highrise business district with high security precautions. And we will completely loose this architectural mirroring of political ideals so characteristic of Scandinavian welfare states in the postwar period. Giedion, Sigfried (1944). The Need for a New Monumentality in Zucker, Paul (ed. ): New Architecture and City Planning. A Symposium. New York: Philosophical Library. Hoem, Siri (2015). Regjeringskvartalet: En historisk rivetabbe in Aftenposten. Oslo: Schibsted, 04.08.2015. Tostrup, Elisabeth (2012). Høye idealer på kronglete tomt. Konkurransen om ny regjeringsbygning i 1939-1940 in Arkitekturårbok 2012. Oslo: Arkitekturmuseet for arkitektur, kunst og design. This article is available for download as docx and pdf.